The horror genre seems to be relegated to either Jack the Ripper, zombies, or Cthulhu when it comes to board and card games. The deck building genre has seen a lot of growth, especially when you consider many have added boards and cooperative play. Terrors of London looks to expand with several different things the go bump in the night, along with a unique Victorian setting. I was able to ask Brad Pye about the game, which is currently funding on Kickstarter. What got you into deck builders? The first deck builder I played, I think like everyone else, was Dominion. It really was a bit of genius. The idea of building your deck whilst you play just improved on many of the problems with older deck driven card games. I think we have all these deck building games on the market today because of how great that concept was. From there, I was quite hooked and played a ton of other deck builders as they came out over the years like Legendary, Core Worlds, XenoShyft and many others. Why set it in Victorian times? What a great period. We always loved the noir feel of London during this time. The wet cobbled streets soaked in an evening mist. London felt like it was full of intrigue with these poorly lit streets adjacent to gothic style churches. You could just imagine that every dark alleyway could lead you to an unknown evil. Especially with the tales of Jack the Ripper, Spring Heel Jack, literature like Mary Shelley’s Frankenstein and all the macabre productions held in the small theaters spread around the city. It just felt like the perfect time to tell the story of Terrors of London. Each player takes the role of an Overlord from one of four factions. Will the player want to get cards from other factions into their deck? Absolutely. 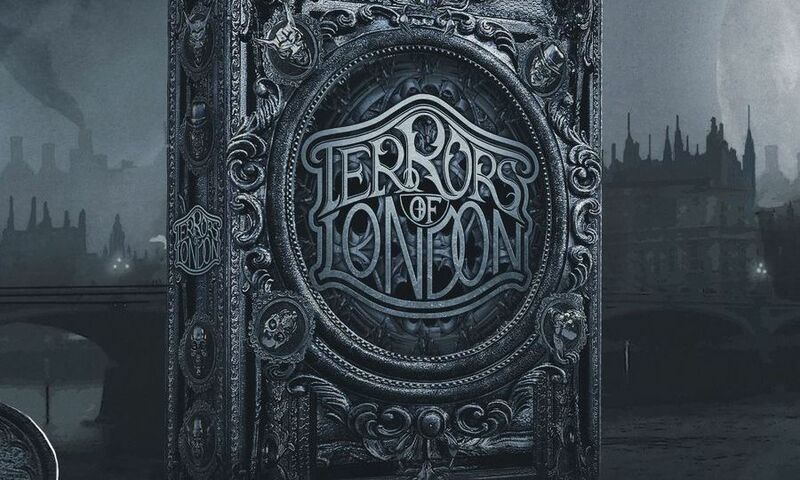 In Terrors of London the four factions represent the division of power within the supernatural world. Each with there own unique supernatural abilities. We always imagined the Overlords would want as much power as they could gain, and as each faction represent a different set of supernatural powers, with all of them at an Overlord’s side they could command the full power of the supernatural world. This is what lead to creating the Horde mechanic within the game. That combining monsters across factions would lead to the most powerful combinations. Overlords are still associated with factions and they gain extra benefits from their own factions, so you will still want to get some monsters of your Overlord’s faction in your deck. What makes each Overlord unique? Each Overlord has a unique ability that they may use once per turn. This allows a player to pursue different game strategies with each Overlord. Each Overlord also has four cards called Influence Cards. A player can choose any two of these cards to augment his starting hand. Each Influence card lends towards slightly different strategies and complements the Overlord in different ways. With the four cards and the overlords unique ability there is quite a lot of different combinations to try. What makes your player interaction different from something like Shards of Infinity or Star Realms? In many ways the player interactions are very similar. With Terrors of London we really wanted to focus on the turn by turn buy strategies, monster synergies and hand management by encouraging players to want to strategical plan out their turns as much as possible. With the monster synergies and horde combinations, buying the right monster or relic at the right stage is crucial and the ability to be able to possibly disrupt your opponents ability to do so is very rewarding. What is the difference between hand management and deck management? In different types of card games hand management can mean slightly different things, but in general it is playing the right cards in the right order to obtain the most advantageous turn possible. In a lot of deck builders you get the feeling you want to just flop your hand down and add up all the bonuses. With Terrors of London focusing more on hand management the order in which you play monsters from your hand can make a massive difference in the outcome of that round. Often monsters can be quite versatile and a player could try play their turn more towards high damage, money, card cycling, regeneration and others. A player could chose to push out some quick damage for the immediate turn or stagger the round by focusing economically by getting monsters on top of their deck for later turns or buying a monster from the market and then getting an ability to pull that monster from their discard pile to use that turn. These options can all be done with the same hand and it just depends on how a player chooses to manage the cards in their hand. Deck manage management in Terrors of London represents the strategy of adding the correct cards to your deck for the most successful build. It feeds into hand management as it allows you to get better cards into your hand to plan your turn. How do you create hordes of monsters using the cards that you play? Once there are some monsters in play, a player can take an action that allows them to group two monsters together. This is called forming a horde and you can grow that horde as the turn progresses by adding more monsters to it. Each monster can horde with two other faction monsters, one on each side of that monster. For instance, monsters of the Mortal faction can pair with monsters from the Spirit or Beast faction. The relationship of the factions in Terrors of London is circular in nature so effectively if a player had enough monsters of the right factions they could all be joined together to form hordes of almost any size, as long as you had the monsters to do so. Whenever you create a new horde or add a monster to a horde you can activate a horde ability off any monster that is in that horde, not just of the monster you added. So as the horde grows your choice between which abilities to activate increases and with it your strategic goals for that turn. Is there a possibility of more factions or Overlords in the future? Yes I think we would definitely like to add more Overlords as the game grows. With the Overlord starter cards and Overlord ability combinations there is still a bunch of ideas we could explore and add to the game. When we first started planing the world of Terrors of London we didn’t want to have too many factions. Four just felt right. With too many factions within the world it can start to dilute the identity and impact of each faction within the setting. So it would really have to feel thematically correct before we added another faction to the world. We wouldn’t want to add a fifth faction to an expansion at some stage just because it added another game feature. So no plans for another faction at this point. As you can see, the art looks fantastic and truly captures the Victorian age. If you like deck builders with a lot of player interaction, then definitely give Terrors of London a look. It’s fully funded on Kickstarter, and you can get the basic set for $18 or the deluxe set that includes an expansion for $39.